Used pallets are in abundance as they are often used once and then discarded, you can either pick them up for free or really cheaply for small batch of them. All you need to do is reach out to some local businesses, and you should be in business! Most companies that get goods shipped in on pallets are looking to offload them for free. 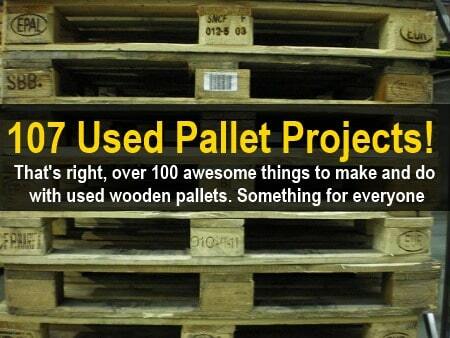 This makes wooden pallets great for low-cost DIY projects. One word of advice with pallets is to ALWAYS get the HEAT TREATED pallets and not the chemically treated ones, you may be asking yourself ” well how do I know what pallet is what. The picture below shows you if a pallet has been heat-treated and chemically treated. You want to look for pallets marked with HT which stands for ‘heat treated’. It seems that everyone into canning or prepping loves those expensive rack-type storage systems with the shelves tilted forward, so that when you take out an item from the front, a new one slides down from the back… Here is a nice simple tutorial showing how to make something similar from free pallets (make sure you use heat treated pallets, not chemically treated). The tutorial isn’t the most detailed, but you can easily see from the photos how it is all put together. Bike trailers are surprisingly useful and you can actually carry far, far more gear than you could carry on your person with a rucksack etc. You can also cover greater distances, faster. You could, of course, clean yours up a bit better than this. A lick of paint might work well. Depends on where you are putting it I guess… This is perfectly good for the garage or shed! This great little DIY rabbit hutch would be excellent for keeping rabbits as pets and breeding rabbits to eat. There are two types of people reading this post – one is going yum, yum and that other is mortified about the idea of eating pet rabbits! Your motivation for keeping rabbits doesn’t matter, as long as they are cared for and kept in decent sized hutch. Actually, if you were into breeding rabbits, you could build several of these cheap pallet hutches. If you’ve got the space, you should keep some chickens, simple as that! They are low cost, low maintenance and they recycle your waste food into eggs each day and they can also provide you with meat if you breed them. They are perfect for homesteaders, preppers and anyone wanting to be more self-sufficient. If space is limited, you can even keep just two or three chickens in a small coop like the one above. This is a great DIY chicken coop made from some old pallets. This is a great low-cost project, with the only real cost being for the chicken wire. Whilst it is only a small chicken coop, there is no reason why you couldn’t build a larger version for more chickens. The other pallet hacks (I’ve featured either here or on the Facebook page) have been really popular, so here’s another one. Make a feeder for your livestock with five pallets. No instructions, but you get the design from the photo. Pretty easy to build and you should have no problem picking up the pallets for free. This chicken coop is made entirely from free reclaimed pallets and the estimated cost of building the coop with new timber is around $1000! A word of caution – it is super easy to pick up free pallets, but if you are growing food or keeping animals in them, you want to make sure they are heat treated and not chemically treated… You don’t want any of those nasty chemicals leaching out into your food-chain. We did a post a while back: How to Make a Better Strawberry Pallet Planter which also explains how to tell if a pallet has been heat-treated or chemically treated. Seriously, no matter what scale of gardening/growing you are doing, using pallets in the way to create ordered, low maintenance raised beds, has got to be a winner, although this won’t work for crops such as potatoes. Check out the post below for a whole series of posts on pallet gardening like this. This DIY pallet herb garden project from ‘DIY Show Off’ looks awesome! It looks great and it saves a huge amount of space. I think you could even hang or attach it to a wall a bit higher up. It’s also great as you could have it right by the kitchen door, so you can just lean out cut some herbs and carry on cooking. Having a potters bench is pretty handy. It can hold your pots at the right height and to make this even better I would add hooks and hang some tools you might need that day. I have lost count of the number of DIY posts we have done about dismantling and reusing shipping pallets. 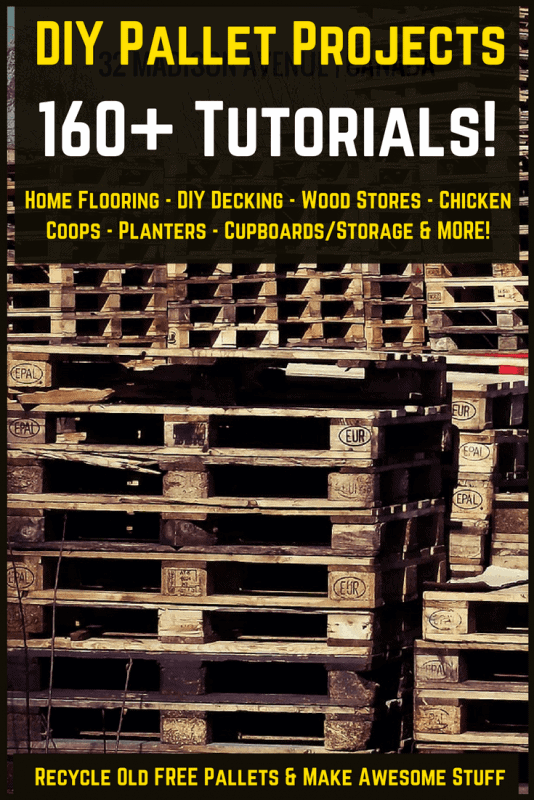 Wooden pallets are the ultimate free resource for DIYers. They are plentiful and available for free if you know where to look. Use the K.W.N search facility and search PALLETS to see all the other posts we have done. Pallets are amazing, that being said I have found 29 pallet projects you might enjoy tackling this spring. Pallets are so versatile and can pretty much be made into anything if nothing else pallets ( heat treated only ) can be used for emergency firewood. We have featured loads and loads of DIY pallet projects before (use the K.W.N search facility and search: pallets), but they have mostly been tutorials on how to make a single project from some old pallets.